Do you have a tutorial to do this because i can't manage to make it work together ! I have a Monome 64, Millumin & Monomal. There is no tutorial. Sorry. Be sure you activated OSC in Millumin (click on the "Device" button in the icon bar), and that you launched MonomeSerial (so your Monome sends/receives OSC messages). I did it and MonomeSerial doesn't want to launch because of a port error. An error occurs while initializing the connection. Please check that the port is not already used by an other application. Obviously, you pointed your own error : you did not configure the ports correctly. In Millumin it should be 5001 and 5000. In MonomeSerial it should be 8080 and 8000. Maybe, you don't even need to run MonomeSerial (please refer to Monome documentation and forums, to be sure you correctly installed your Monome). Thank you for those quick answer ! So, i reinstalled the Monome following the setup page on Monome.org. 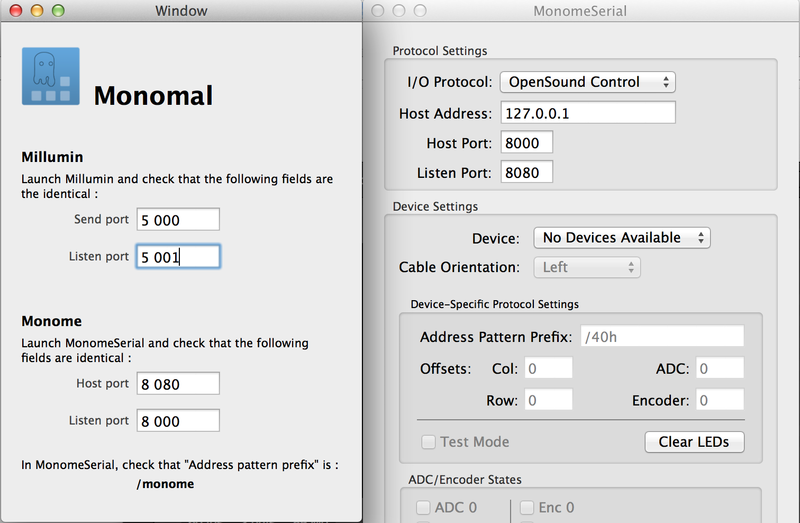 I checked the devices in Millumin and Monomeserial like so but still it doesn't appear in Millumin. The Monome test 3 in Max doesn't work neither so i'm a bit lost right now ! P.S. : Tu es francophone ? However, you need to make your Monome work first. Please refer to Monome documentation, or ask Monome's forum about your connection problem. Is there an overview of the keys's functions ? Sorry, no documentation as Monomal for Millumin is an experimental project. The Monomal pages are somehow similar to the version for Modul8.